LLumar home window tinting dealers in Orlando install high-quality tint. Make your home a more enjoyable place to be, especially in the hotter months, and help lower your energy expenses with home window tinting. Since 1961, LLumar's residential window tints have helped protect homeowners from the sun's tough heat and destructive rays. Today, we continue to help people live comfortably in their homes, whether in an apartment, condo, or house! Your home window tinting company has been carefully selected and certified in order to provide you with an awesome service experience. Get a fast and free tinting estimate from your Orlando residential tint location! After our certified technicians in Orlando install your home window tint, you can better enjoy your space knowing that you're helping to protect your family from the sun's harsh rays, while also adding an extra layer of security. 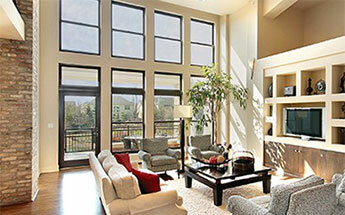 Have the windows in your home tinted to help prevent the fading of furnishings, floors, and artwork by the sun. It helps keep out up to 99% of the sun’s destructive ultraviolet rays that lead to discoloration and fading. It even helps keep your Orlando home cooler, longer. In fact, many of our customers reported saving as much as 15% on their home energy expenses after their window tint was installed! LLumar is LEED-certified, so you could save even more money through local and national tax credits and incentives!